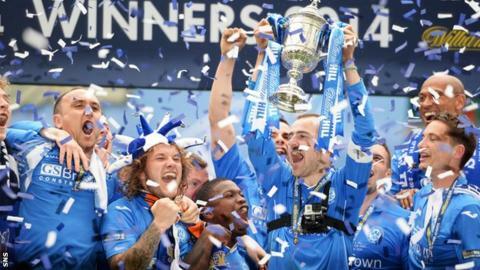 St Johnstone won the first major trophy of their 130-year history after beating Dundee United to lift the Scottish Cup. Steven Anderson and Steven MacLean scored in each half at Celtic Park, with Saints striker Stevie May having a goal ruled out for handball. United twice hit the woodwork but were unable to stem their opponents, or deploy their usual attacking aplomb. And it was a deserved triumph for the Perth side, built on a display of solid intent and organisation. MacLean was a fitting scorer since his work-rate was typical of Tommy Wright's side. For once, competitiveness was a hindrance. The teams were so well-matched they tended to cancel each other out and moments of inspiration were restricted, as much by familiarity as any overbearing sense of occasion. It was always unlikely that a player could catch an opponent unawares when this was the teams' fifth meeting of the season. All the same, individuals could be out-witted by their own sense of alarm. St Johnstone goalkeeper Alan Mannus has been a reliable figure throughout the campaign, but he spilled an early Ryan Dow cross and never wholly recovered his self-assurance. With United's Nadir Ciftci and May both strong and adept enough to hold the ball up when it reached them in attack, play was able to swing from one end to the other with pleasing enough pace. Chances tended to arise out of resourcefulness rather than any sustained attacking pressure. James Dunne, for instance, was deft and agile enough to react when the ball broke to him at the edge of the United penalty area. He arched his body so that he could meet the ball with a stinging volley, but the effort was matched by the ability of goalkeeper Radoslaw Cierzniak to tip the ball over with a stretching save. St Johnstone were the more composed side. United often relying on the counter-attack rather than establishing rhythm or control, but while Ciftci was intermittently involved, the trio of attackers behind him - Dow, Stuart Armstrong and Gary Mackay-Steven - struggled to deliver their usual swift incisiveness. Half-an-hour had gone before they rediscovered that zest, but it was enough to distress the St Johnstone defenders. None of them reacted quickly enough to Andrew Robertson's run and cross, allowing Dow to nick the ball with his heel and send it bouncing off the upright. Nerves were beginning to fray, which might have explained why the United defenders were not well-organised enough to cope with a corner kick just before half-time. It was a conventional delivery - Wotherspoon swinging the ball to the back post - but Anderson had the time and space to hang in mid-air before heading it into the net, after Cierzniak had left his goal and failed to reach the ball. There was only enough time to restart the game before the half-time whistle blew. United had to dwell on the setback, but that fired their resolve and they were eager after the break. Attitude alone would not recover the scoreline, but Ciftci was capable of moments of accomplishment and his free-kick from 20 yards was almost perfectly crafted. The ball bounced off the underside of the bar, though, and Mannus eventually managed to smother it on the line. Tension grew as the game progressed. The lead was such a narrow margin that anxiety seemed the primary concern. There appeared no other explanation for the way May pushed the ball over the line with his hand after his close-range header had been saved. The striker could, after all, have left the ball in the hope that someone else in the crowded six-yard box applied the finishing touch. St Johnstone had to be wary of themselves. The instinct was to drop ever deeper, although United were still restricted to long-range efforts. Robertson saw one shot saved, while Ciftci sent another narrowly wide. That was in keeping with their general performance. United never could shift the forlorn nature of their play and they could not cope with the determined aggression of MacLean. When the ball broke to him in the penalty area, he slid in to challenge Cierzniak before turning the ball over the line while grounded. United only had five minutes left to rescue the game, but that had never seemed likely as an Armstrong effort was blocked and Brian Graham headed wide from inside the six yard box. The triumph already belonged to St Johnstone. Attempt missed. Brian Graham (Dundee United) header from very close range is close, but misses to the left following a corner. Attempt blocked. Stuart Armstrong (Dundee United) right footed shot from the centre of the box is blocked. Chris Millar (St Johnstone) wins a free kick in the attacking half. Attempt saved. Ryan Dow (Dundee United) left footed shot from outside the box is saved in the centre of the goal. Substitution, St Johnstone. Gary McDonald replaces David Wotherspoon. Steven MacLean (St Johnstone) is shown the yellow card. Goal! St Johnstone 2, Dundee United 0. Steven MacLean (St Johnstone) right footed shot from the centre of the box to the centre of the goal. Attempt missed. Nadir Ciftci (Dundee United) right footed shot from outside the box is close, but misses to the left. Attempt missed. Brian Graham (Dundee United) left footed shot from the centre of the box is close, but misses to the left. Attempt missed. Steve May (St Johnstone) right footed shot from a difficult angle and long range on the left misses to the right. Substitution, Dundee United. Brian Graham replaces Paul Paton. Substitution, St Johnstone. Lee Croft replaces Michael O'Halloran. Attempt missed. David Mackay (St Johnstone) header from the centre of the box misses to the right. Corner, St Johnstone. Conceded by Andrew Robertson. Steven MacLean (St Johnstone) wins a free kick in the defensive half. Attempt missed. Keith Watson (Dundee United) right footed shot from the centre of the box is too high. Michael O'Halloran (St Johnstone) wins a free kick in the attacking half. Hand ball by James Dunne (St Johnstone). Attempt missed. David Wotherspoon (St Johnstone) right footed shot from outside the box is high and wide to the right. Substitution, Dundee United. Ryan Gauld replaces Gary Mackay-Steven because of an injury. Corner, Dundee United. Conceded by Alan Mannus. Attempt saved. Andrew Robertson (Dundee United) left footed shot from outside the box is saved in the top left corner.